Going on a hiking trip may be one of the most exciting ways you could possibly spend your free time. The fresh air, the feeling of conquering something through sheer effort and the stunning views are all addictive. In fact, in would be a shame if you left your camera at home and failed to capture the sights, just for fear that the rain might damage it. 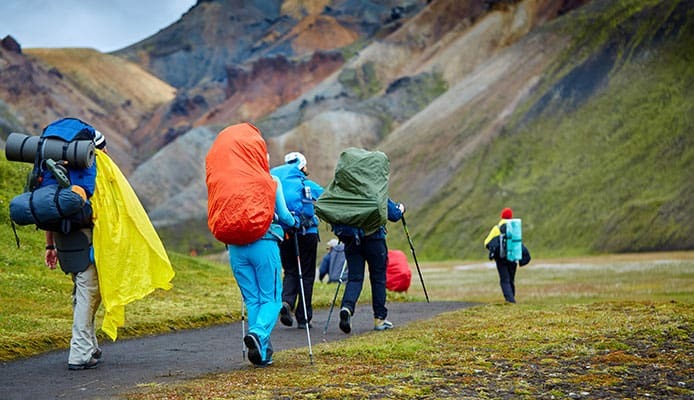 We don’t understand why some hikers do that, when they have so many backpack waterproof cover options to choose from. To help you decide on which one to choose, we’ve put together this best rain cover for backpack items you can find. We’ve looked at their features and analyzed each in detail. Browse through and decide for yourself! 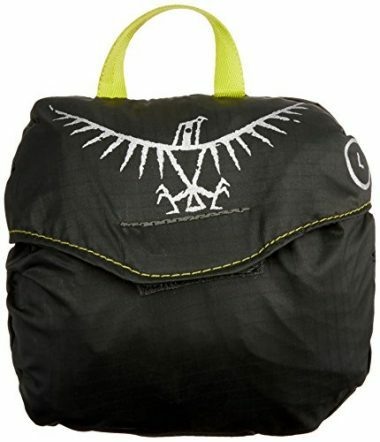 According to the top backpack rain cover reviews, this is the classic, first-choice option for most serious hikers. It fully wraps around your backpack, leaving no part of it exposed to the elements. At the same time, it’s very light and easy to pack and carry around (in its own case, which you get upon purchase). It has a secure hip belt and a harness attachment as well. An extra bonus? The cute graphic design on the backpack cover for rain is reflective, so it’s easy for others to spot you in the dark. Available in a variety of color options, this waterproof backpack cover is ideal for all casual hikers, cyclists or simply outdoors enthusiasts. It is affordable, fully covers your back luggage, the waterproof layer is extra affordable, it’s portable and comes in a variety of sizes. You should select the size you need depending on how big your backpack is, but in case of a mismatch you will get a free exchange or refund. Also, we like how the fabric of this backpack cover for rain is also meant to resist wear and tear, so you’ll be able to enjoy it for a long time. This is the best backpack rain cover if you’re on a budget but still looking for something reliable and which will last you a while. The nylon fibers in this backpack protection cover are designed to be super-durable, not just insofar keeping out rain, but also through the wear and tear of time. 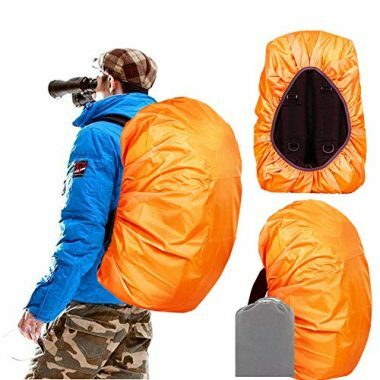 This hiking backpack cover comes with an upgraded buckle strap designed to prevent it from slipping off while you hike. There are a few colors to choose from if you like personalizing, as well. 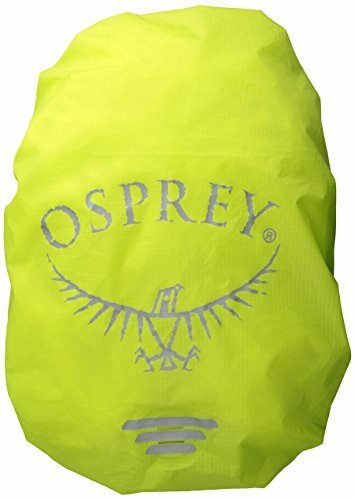 Another entry from Osprey on our top of the best backpack rain cover options, this electric colored protection layer is designed for small backpacks. You can still choose between 2 options (small and extra-small), but it’s meant more for urban dwelling (like a cycling session) than for long camping trips. The electric colors and ultra-reflective graphics ensure your visibility in all conditions. Also, the backpack waterproof cover is ultra-light and packable, just like we’ve come to expect from Osprey. 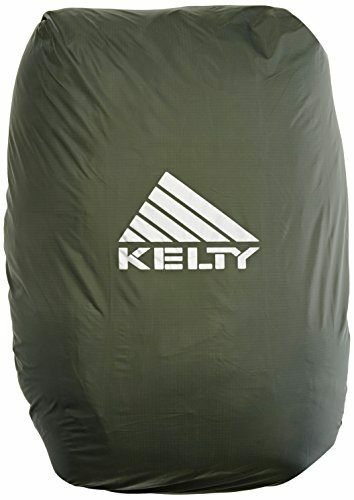 A cult classic, Kelty is another brand enjoying a huge popularity among hikers and campers. With a combination of several types of nylon fibers, this raincover for backpack is everything you’ll need while going through the great outdoors. Your valuables will be kept safe regardless of how the weather shifts, and the fit will be almost perfect, due to its internal adjustable pull cord. A highly universal item, this is the best backpack rain cover regardless of the kind of trip you’re going on. It’s great for camping, hiking, cycling, climbing, riding, commuting and so on, and it protects your backpack from dust, too, not just from rain. 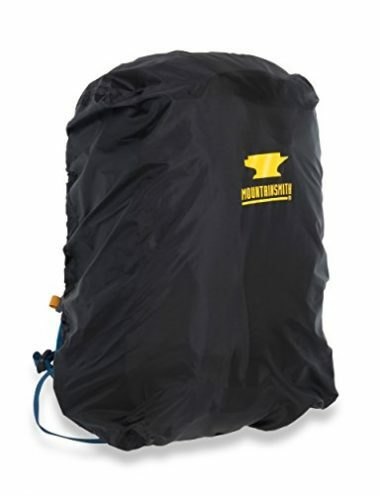 It’s highly durable and very lightweight, making it a top-rated rain cover for backpack and beyond. It features an elastic to help it adjust to the exact dimensions of your back luggage, but it comes in 2 sizes (M and L), too. You can also choose from 3 colors if you prefer a little personalization. This waterproof backpack cover was launched in 2016 and became a favorite with hikers ever since. 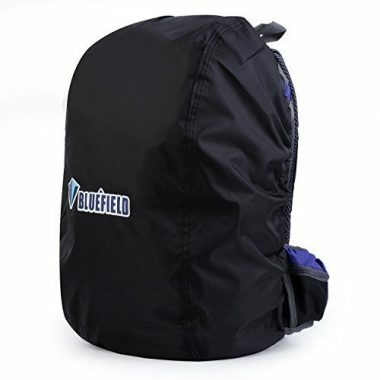 It features impeccable waterproof protection and a perfect fit around your backpack. It’s suitable for regular sized backpacks for hiking, not too small and not too large, but you still get to choose from 2 sizes (S/M and M/L). The bright yellow cover gives you a good visibility in daylight and a decent reflectivity in night time. 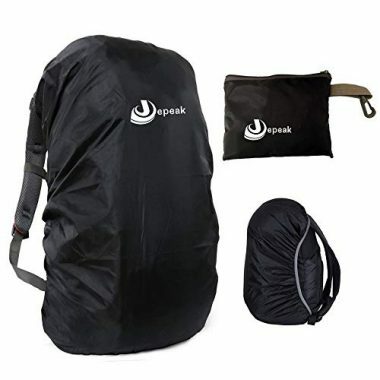 To ensure perfect fit, this hiking backpack cover comes with hook and loop closure, a cinch system and 3 easy to use attachment points. No slipping and no re-adjusting once the backpack waterproof cover is in place. 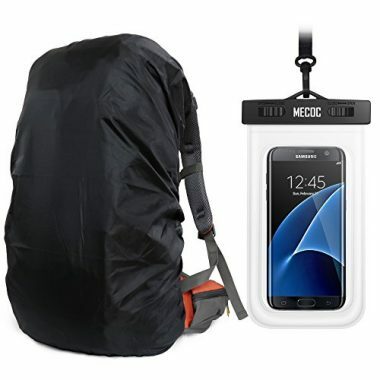 Finally, we have a backpack cover for rain that can accommodate heavy cellphone (and smartphone) users. It has a special pocket for your phone that not only protects is even under heavy rainfall, but makes it easier to access as well. This waterproof case is completely transparent and touch-sensitive, which means you can continue to use your smartphone without endangering it, even if it’s raining. 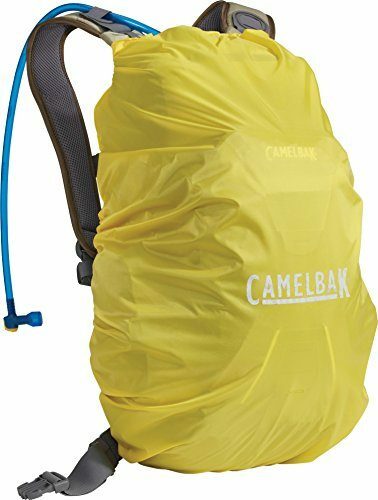 If you don’t like being disconnected for too long, this is the best backpack rain cover for you. Of course, the rain cover has all the rest of the features which you need to expect from this type of product, as well. The Mountainsmith hiking backpack cover is a versatile protection meant to protect your backpack regardless of its size, dimension or how heavy it’s raining. 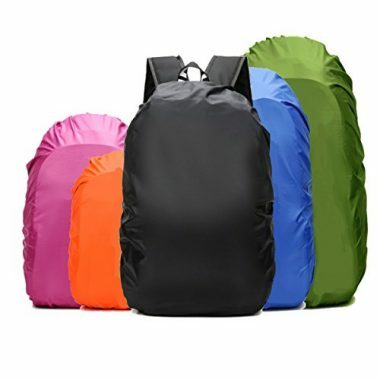 It will fit any backpack size, since you have 4 sizes to choose from when shopping for the cover. Furthermore, perfect fitting will be ensured by the elastic string and the full circumference draw cord, keeping everything tightly wrapped. It’s made from nylon fabric of 190t taffeta so no raindrops will get through. 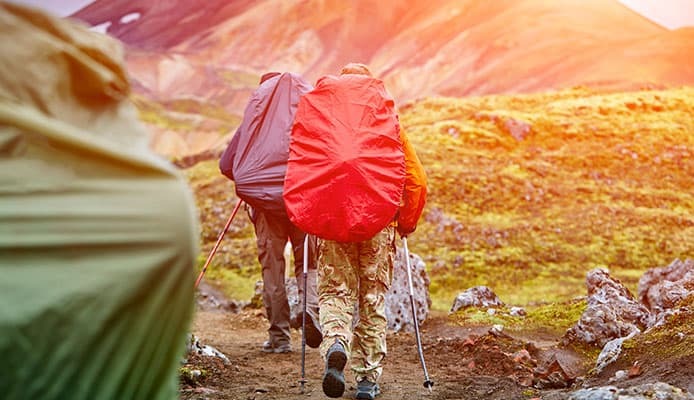 Highly resistant, this hiking backpack cover is meant to withstand not just heavy rainfall, but also strains that may tear or rip through less resistant fabrics. The cover is also compact and portable, allowing you to easily store and carry when it’s not needed. It’s the best rain cover for backpack if you anticipate a challenging journey or you’re going on a true outdoors adventure trip. Still, being as versatile as it is, you can use for schoolbags or laptop bags, too. So, what factors should you take into account when shopping for the best backpack rain cover? It all depends on where you plan to use your waterproof backpack cover. If you have several sizes of backpacks for various uses, maybe consider investing in more than one backpack cover for rain. One for urban use (like your laptop bag or school bag) and one for hiking or long camping trips where you need a bigger pack, for example. Any top-rated rain cover for backpack (such as our list of 10 best options) will be made of a material guaranteed to be waterproof. Still, some of them might have extra perks (dust-proof or resistant against tears, for instance). Straps are essential for keeping your hiking backpack cover in place. Look for a model that features at least an elastic cord or drawstring to ensure perfect fit, and even some additional features if you want to make sure. Water-repellant means that the fabric will repel water, not allowing it to permeate. Both water-resistant and waterproof fabrics are water-repellant, but while water-resistant ones will only be effective against light rain, waterproof ones will be able to withstand even rainstorms. All of the backpack rain covers on our list are waterproof, making them the highest level of protection possible. Color is a matter of personal preference mostly, so feel free to choose one you like. However, bear in mind that if you’re hiking in remote or dangerous areas, it would be safe to choose an easy-to-spot and light-reflective color. In case the rescue teams need to find you, this can make their job easier. The adjustable drawstring helps you fit the waterproof backpack cover over your backpack better, leaving no crevice open for rain to get in. It helps ensure that the cover fits perfectly, so we recommend choosing an option that features it. Some of the best rain cover for backpack models are also guaranteed to be more durable. This means that you will be able to use them for a longer time, but also that the fabric is less likely to tear under strain. Q: Why Protect Your Backpack From Rain? A: If you’re using your backpack in an urban setting, while going from point A to point B, you may get to relief soon if caught by a rain shower. However, this doesn’t mean you shouldn’t protect all the valuables you have inside the backpack. Some of them could even be fatally damaged by water (the electronics, for instance). If you’re using your backpack in a nature setting (for camping, hiking and so on), then the need to protect your backpack with a rain cover is even greater. It’s not just that you may have the same kind of sensitive items inside it (like a phone), but also everything you need for living in the next few days. Imagine getting to your destination, but the clothes on you as well as those in your backpack and your sleeping bag are all wet! This could pose a serious health risk (like hypothermia). To stay comfortable and safe, you should be able to protect the contents of your backpack with a specially designed rain cover. Venturing outdoors and getting caught in a rain shower can be challenging if you’re unprepared. 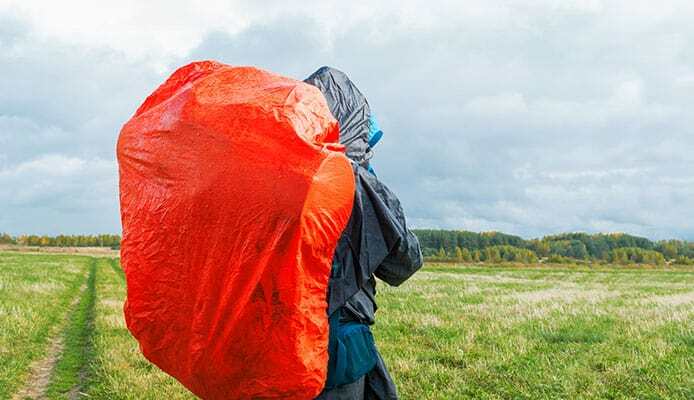 However, if you’re fully armed with one of the best backpack rain cover options and you’re heading somewhere nice, it may also be one of the most exciting experiences you’ll have. Just make sure your backpack is protected and you don’t forget your waterproof socks, either. Happy adventures ahead! How to Hike Safely During the Rainy Season, Wta.org. Were you ever caught by a nasty rain during a hike in woods and while wearing an unprotected backpack? Do you have a frustrating but funny story to share with the other readers? Or thoughts on the best backpack rain cover to use? Don’t hesitate to share them in the comment section below. We’re always thrilled to hear from fellow outdoors enthusiasts!